Please join us for a night of good food and good company on May 8. We return to the charming Camargo Club to welcome our new Board and enjoy remarks from Dr. Timothy McCarthy on "Trump's Tweets--A Close Reading: Is There Meaning or Method to the Madness?" While a timely political theme, it’s meant for a politically diverse crowd, and has been sold out in several venues. Tim will also have some question and answer time as part of the discussion. We call it the Shore Dinner in nostalgia for our time in Cambridge and the great port city of Boston. Just as Harvard students gather to part from friends in their last weeks of the school year, we gather to say goodbye to retiring Board members and pass the gavel the new President and Directors. It can also be a chance to meet some of our new students. Ten students were admitted in this year with a record low 4.6% acceptance rate. Katie Nappi, 644 Watchpoint Drive, Cincinnati OH 45230. Please include the names of any guests. 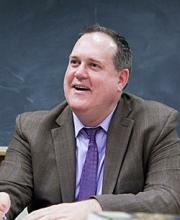 Timothy Patrick McCarthy ‘93 is an award-winning scholar, teacher, activist, and public servant. He holds a joint faculty appointment in Harvard’s undergraduate honors program in History and Literature, the Graduate School of Education, Harvard Business School, and the John F. Kennedy School of Government, where he is Core Faculty and Director of Culture Change & Social Justice Initiatives and the Emerging Human Rights Leaders Program at the Carr Center for Human Rights Policy. Dr. McCarthy is also the Stanley Paterson Professor of American History in the Boston Clemente Course, a college-level humanities course in Dorchester, Massachusetts, and co-recipient of the 2015 National Humanities Medal. Dr. McCarthy graduated with honors from Harvard College and Columbia University, where he earned his Ph.D. in History.